Propane / Residential | Griffin Oil and Propane | Suffok Energies, Inc.
Propane is a proven energy source every homeowner can count on, even when the power is out. Propane is used in over 8 million households as a clean and efficient energy source. It is the most common liquefied petroleum gas whose versatility enables it use as about 4% our total energy needs. The most common residential uses can include heat, hot water, cooking, grilling, fireplaces, clothes drying and outdoor living spaces. Propane is a nontoxic fuel that does not contaminate the soil or groundwater, thus allowing for it to be stored underground or above ground. 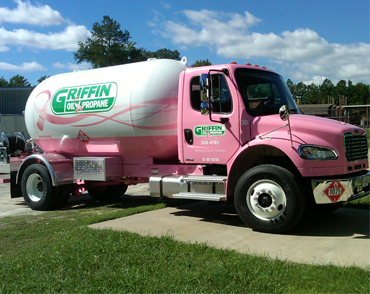 Griffin Oil & Propane has developed a sales and service department to handle all of your propane needs. Our experienced staff can develop a system to safely accommodate your specific application. We sell, service and install a wide range of propane appliances ranging from gas logs to stoves to lamps; many of which can be seen in our live-burn showrooms. We also offer a Contractor Program that allows for cost savings and guidance on new construction from the ground up. With the most competitive program in the area, we can handle all of your new home desires. Contact one of our offices to see how we can specifically help you make the building process easier.